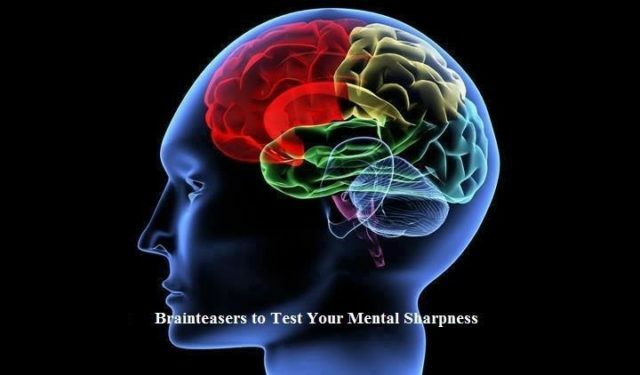 Brain teasers are a sure way to have fun, it is a kind of puzzle that requires you to do some brain-storming to be able to solve it, it usually comes in the form of question and answers, unconventional questions that will demand that you think in an unconventional way to be able to get the answer right. It is a good way to exercise the brain. When it seems that your brain needs some awakening, try answering some brain teasing questions. 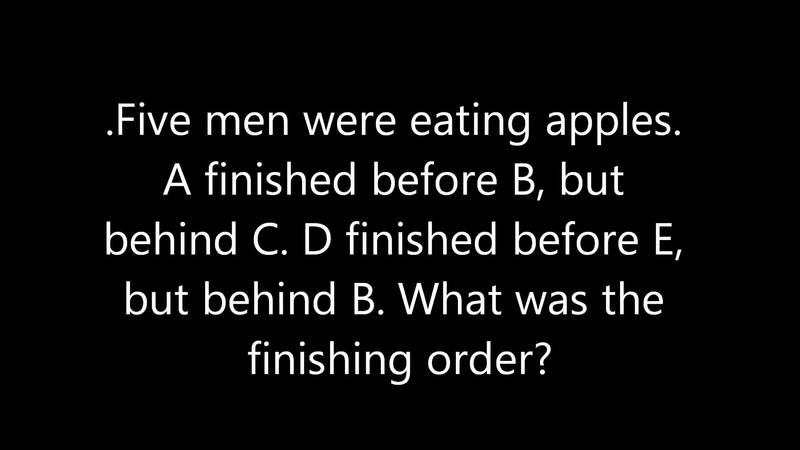 Here are some brain teasers with answers that will interest you. Q1: How many seconds do you have in a year? Q2: If 5 peacocks lay 10 eggs in 2 days, then how many peacocks will lay 100 eggs in 24 days? Q3: How many oranges can you put into an empty container? Ans: Only one orange – If you put one orange, it won’t be an empty container. Q4: When you add two letters, the five letter word becomes shorter. What is it? Q5: You are running in a 5000-meter marathon race and you overcame the person in the second place. At what place you are? Q6: What is the reason that it is considered illegal to bury a man living in North America in South America? Q7: If 5 men take around 3 hours to dig 3 holes, how long will it take for 2 men to dig half a hole? Ans: There is nothing called a half hole and it cannot be dug! Q8: Two girls played and completed 5 games of chess. Each of them won the same number of games and there wasn’t any tie in any game. How did it happen? Q9: A farmer had 20 cows. Due to contagious disease, suddenly all but 11 cows died suddenly. How many cows does he now have? Q10: You can see a beautiful red house on your left and a mesmeric greenhouse on your right, a warming and attractive pink house on your front. Then where is the white house? Q11: What is at the end of a rainbow? Q12: What starts with the letter “t”, is filled with “t” and ends in “t”? Q13: A girl is sitting in a house at night that has no lights on at all. There is no lamp, no candle, nothing. Yet she is reading. How? Ans: The woman is blind and is reading braille. Q14: How far can a dog run into the woods? Ans: The dog can run into the woods only to the half of the wood – than it would run out of the woods. Q15: If there are 3 apples and you take away 2, how many do you have? Ans: If you take 2 apples than you have of course 2. Q16: Beth’s mother has three daughters. One is called Lara, the other one is Sara. What is the name of the third daughter? Q17: I’m tall when I’m young and I’m short when I’m old. What am I? Q18: In a one-story pink house, there was a pink person, a pink cat, a pink fish, a pink computer, a pink chair, a pink table, a pink telephone, a pink shower– everything was pink! What colour were the stairs? Ans: There weren’t any stairs, it was a one-story house. Q19: What has hands but can not clap? Q20: A train leaves from Halifax, Nova Scotia heading towards Vancouver, British Columbia at 120 km/h. Three hours later, a train leaves Vancouver heading towards Halifax at 180 km/h. Assume there are exactly 6000 kilometres between Vancouver and Halifax. When they meet, which train is closer to Halifax? Ans: Both trains would be at the same spot when they meet therefore they are both equally close to Halifax. Q21: What goes around and around the wood but never goes into the wood? Ans: The bark on a tree. Q22: Two mothers and two daughters went out to eat, everyone ate one burger, yet only three burgers were eaten in all. How is this possible? Ans: They were a grandmother, mother and daughter. Q23: A cowboy rides into town on Friday, stays for three days, then leaves on Friday. How did he do it? Ans: His horse’s name was Friday. Q24: You walk across a bridge and you see a boat full of people yet there isn’t a single person on board. How is that possible? Ans: All the people on the boat are married. Q25: A boy was rushed to the hospital emergency room. The ER doctor saw the boy and said, “I cannot operate on this boy. He is my son.” But the doctor was not the boy’s father. How could that be? Ans: The doctor was his mom. Q26: You walk into a room with a match, a kerosene lamp, a candle, and a fireplace. Which do you light first? Q27: What gets wetter and wetter the more it dries? Q28: You draw a line. Without touching it, how do you make the line longer? Ans: You draw a shorter line next to it, and it becomes the longer line. Q29: A man was outside taking a walk when it started to rain. The man didn’t have an umbrella and he wasn’t wearing a hat. His clothes got soaked, yet not a single hair on his head got wet. How could this happen? Ans: The man was bald. Q30: What can run but can’t walk? Ans: A drop of water. Q31: A house has 4 walls. All of the walls are facing south, and a bear is circling the house. What colour is the bear? Ans: The house is on the north pole, so the bear is white. Q32: Which weighs more, a pound of feathers or a pound of bricks? Ans: Neither, they both weigh one pound. Q33: How many months have 28 days? Q34: Name four days of the week that start with the letter “t”? Ans: Tuesday, Thursday, today, and tomorrow. Read Also: Can Men Really Lactate? Q35: Two mothers and two daughters had a picnic of ham, potato salad and beans. Each individual ate only one dish.How is it possible that no one went hungry? Ans: The picnic-goers are a grandmother, a mother and a daughter. Q36: If Sally’s daughter is my daughter’s mother, what am I to Sally? Ans: I am Sally’s daughter. Q37: There are four houses all in a row. The Wallaces live next to the Clarks, but not next to the Randalls. If the Randalls do not live next to the Lodens, who are the Lodens’ next-door neighbours? Q38: How many years are there between 5 B.C. and 5 A.D.? Q39: How can you throw a ball as hard as you can, to only have it come back to you, even if it doesn’t bounce off anything? Ans: Throw the ball straight up in the air. Q40: My name is Ruger, I live on a farm. There are four other dogs on the farm with me. Their names are Snowy, Flash, Speedy and Brownie. What do you think the fifth dog’s name is? Q41: I am an odd number. Take away one letter and I become even. What number am I? Ans: Seven (take away the ‘s’ and it becomes ‘even’). Q42: The more you take, the more you leave behind. What are they? Q43: What two keys can’t open any door? Ans: A monkey and a donkey. Q44: What invention lets you look right through a wall? Q45: What’s full of holes but still holds water? Q46: If an electric train is going east at 60 miles an hour and there is a strong westerly wind, which way does the smoke from the train drift? Ans: There is no smoke coming from electric trains. Q48: How do dog catchers get paid? Q49: What never asks questions but is often answered? Q50: What belongs to you but other people use it more than you? Ans: Right between the eyes. Q52: What 5-letter word becomes shorter when you add two letters to it? Q53: Imagine you’re in a room that is filling with water. There are no windows or doors. How do you get out? Q54: What do the numbers 11, 69, and 88 all have in common? Ans: The read the same right side up and upside down. Q55: What word looks the same backwards and upside down? Q56: A boy fell off a 30-meter ladder but did not get hurt. Why not? Ans: He fell off the bottom step. Q57: Using only addition, how do you add eight 8’s and get the number 1000? Ans: 888 + 88 + 8 + 8 + 8 = 1000. Q58: I have a large money-box, 48 centimetres square and 42 centimetres tall. Roughly how many coins can I place in my empty money-box? Ans: Just one, after which it will no longer be empty. Q59: Which travels faster? Hot or Cold? Ans: Hot is faster ‘coz you can catch a cold. Q60: What has a mouth but cannot eat, what moves but has no legs and what has a bank but cannot put money in it? Q61: Guess the next three letters in the series. Ans: I, T, S — the first letter of every word in the sentence. Q62: A boy is walking down the road with a doctor. While the boy is the doctor’s son, the doctor isn’t the boy’s father. Then who is the doctor? Ans: The doctor is the boy’s mother. Q63: A man condemned to death has the option of picking one of the mentioned three rooms. The first room is a furnace filled with feeding flames, the second has armed men with loaded guns while the third has lions starving for years. Which one should the man choose? Ans: The third room, because lions hungry for years would be long dead! Q64: Arnold Schwarzenegger has a long one. Michael J. Fox has a short one. Madonna doesn’t use hers. Bill Clinton always uses his. The Pope never uses his. What is it? Q65: First I threw away the outside and cooked the inside, then I ate the outside and threw away the inside, what did I eat? Q66: When you have me, you immediately feel like sharing me. But, if you do share me, you don’t have me. Q67: Joseph and Lena are found dead on the floor with some water around. The windows are open and a strong wind draft is blowing the curtains around. How did they die? Ans: Joseph and Lena were goldfishes. The wind tipped their bowl over, hence killing them! Q68: A man is trapped in a sealed room with only two doors. One of them leads to a fire-breathing dragon, while the other one leads to a room made up of a magnifying glass, anyone who dares to enter it is charred off before they know it. How does he escape? Ans: He will wait for nightfall and then step out from the glass room! Q69: What can you hold without ever touching, or using your hands? Q70: I am the beginning of sorrow and the end of sickness. You cannot express happiness without me yet I am in the midst of crosses. I am always in risk yet never in danger. You may find me in the sun but I am never out of darkness.